Three-quarters of a century ago, a woman named Exa Ely took notice of a patch of scrubby land along Sepulveda Boulevard in Manhattan Beach. It’s hard to figure what exactly about it struck her imagination. The land was on the downward slope of a hill, just below the sand dunes that criss-crossed the town. Maybe it reminded her of the scrubland from her childhood in Texas. Ely was, at any rate, an unusually willful woman. She’d come to California alone and put herself through law school at a time few women did such a thing. She married Bill Ely, a young engineer at Douglas Aircraft who was from Manhattan Beach — in fact, just around the corner from the plot of land that piqued Exa’s interest — and they started a family in nearby Inglewood. Exa didn’t drive so she took a bus to downtown LA, found the property records, contacted the two different owners for the land, and organized its purchase in 1946. A co-worker of her husband, and close family friend, Chuck Smartt, along with his wife, Claire, partnered with the Elys.Thus was born the Ely-Smartt Convenience Center, on Sepulveda between 9th and 10th Streets. “It was spearheaded by my grandma,” said Heather Miller, who began to work in management of the shopping center 20 years ago after being mentored by Exa, who herself managed the complex until her passing at the age of 85. “She was the power from the beginning,” Miller said. “She was an amazing mentor and friend, and we [current Ely and Smartt generations] are all indebted to her and the Smartts for cultivating this great long-lasting family business relationship,” Miller said. Today, the shopping center is known as the Ely & Smartt Shops and has become one of the few constants on the ever-changing Sepulveda Boulevard. The original building is still home to its first tenant, Baskin-Robbins ice cream, which opened in 1956. Miller has commissioned a mural on the north-facing wall of Baskin-Robbins to celebrate the shopping center’s endurance as part of the fabric of Manhattan Beach. 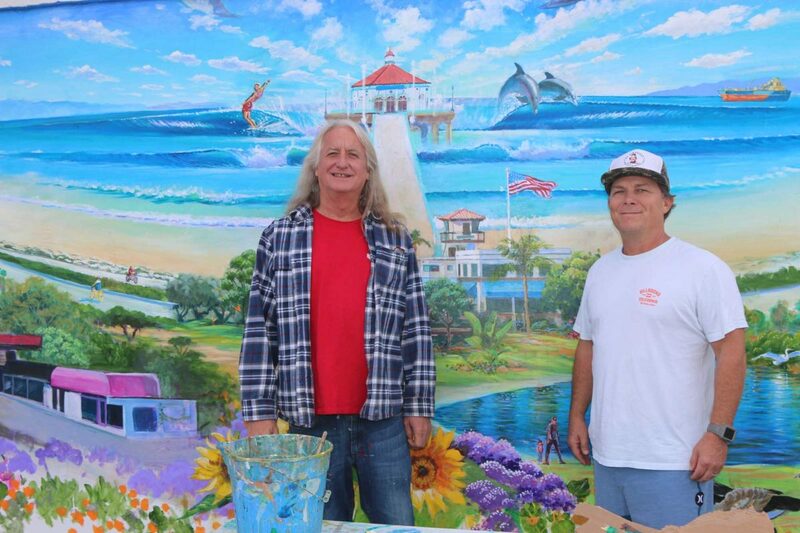 Artist Kevin Anderson, perhaps best known for his epic 72-foot mural celebrating San Diego County inside a pedestrian tunnel in Mission Valley, admitted that he was skeptical when Miller first contacted him. Anderson, who is based in Encinitas, hadn’t spent much time in Manhattan Beach, so he drove up and soaked in the place. Anderson hoped to complete the mural this week. He’s spent 15 days working on it. People have regularly interrupted his work with offers of ice cream, and he’s interrupted himself with repeated excursions to El Gringo, running the full gamut of its burritos. Bill Graw, who opened the second of his four El Gringo restaurants in the center 15 years ago, has been coming to Ely & Smartt since he was a child. His mother, Annette, worked a half block away at Pat Sullivan Realty and would bring him to work with her. After Graw established his first restaurant in Hermosa Beach, he dreamed of opening up a second El Gringo at his old stomping grounds. No sooner had he hoped for it and his favorite spot opened up. He said that while most people might think of the Beach Cities’ waterfront business districts as city centers, the Sepulveda corridor is actually its economic hub — and places like Ely & Smartt and the Goat Hill shopping center, a few blocks south, are particularly family-oriented. The tenants are also like family. Montage owner Dianne de la Garrigue, also a Manhattan Beach native, has operated her spa since the 1990s. Baskin-Robbins was owned by two generations of the Berry/Brown family until 2011 (Richard Berry famously kept making cakes at the location into his 50s), when Dave Carroll bought it. But manager Justin Rankin has been at the shop for decades. Barsha Wines and Spirits is a relative newcomer, arriving only six years ago, but is the latest in a long line of liquor and wine stores. Owner Adnen Marouani carries a boutique selection of spirits as an homage to the building’s history. Marouani echoed Graw’s observation that many of his customers come to the center for multiple reasons — a glass of wine after visiting the spa, or a beer before having Mexican food. The shopping center also includes the long building just above it, home to another seven small businesses, including O-Sho Japanese restaurant (which has been there 35 years), Door-to-Door Valet Cleaners (whose owners, the Veera family, got their start in the business as teenagers at a dry cleaners at Ely-Smartt and now own nine stores), and two more tenants who’ve been there for a quarter century, Body by Design and Magic Nail Spa. The common thread is the families who started it all. Richard Ely and Tim Smartt, the only sons of their respective families, are still the managing partners. Graw said that while the stores are Mom and Pops operations, this is made possible because the ownership has the same ethos. Heather Miller said the mural is intended to honor this long and mostly unsung history that started when her grandmother saw possibility in a vacant lot. Or as the mural artist Kevin Anderson put it, the hope is to keep “a lot of cool stuff” between 9th and 10th Street along Sepulveda. “I hope this place stays for a long time,” Anderson said, as he applied a final brush stroke to his mural. A ribbon cutting for the new mural, featuring a champagne toast, ice cream and mini-burritos will take place Dec. 19 at about 4 p.m.